Over 24,000 tourists visited the site Sunday and more than 27,000 Saturday, he said. The statue, dedicated to `Iron Man of India' Sardar Vallabhbhai Patel, is situated on an islet near the Sardar Sarovar Dam in Kevadiya. Prime Minister Narendra Modi inaugurated it on October 31. Haider said the government is ready to welcome any number of tourists at the site. He said the new tourist attraction in Gujarat would help increase the number of travellers visiting the state from other parts of the country and also abroad. "Gujarat has registered 17 per cent year-on growth in tourism with a total 5.2 crore tourists visiting the state in 2017. The Statue of Unity will help in achieving considerable growth in the arrival of tourists to Gujarat," he said. 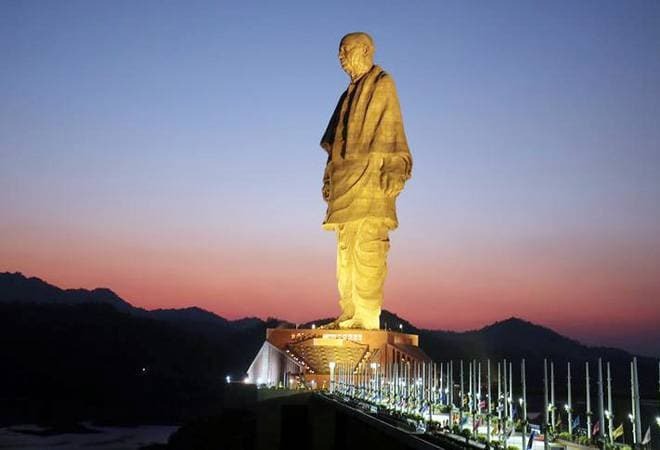 The towering structure, built at the cost of Rs 2,989 crore, is near twice the height of Statue of Liberty in the United States and also bigger than Spring Temple Buddha, China (153 metres) and Ushika Daibustum Japan (120 metres). Among the prime attractions at the site is a viewers gallery inside the statue located at the height of 135 metres with a capacity to accommodate 200 persons at a time. The ambitious project was announced in 2010, and a special purpose vehicle was set up by the state government for its construction.